Alex and Vagelis both win KDD-dissertation distinction! 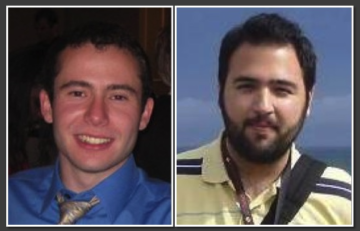 Dr. Alex Beutel and Prof. Evangelos (Vagelis) Papalexakis, each attracted the ‘runner-up’ distinction for the prestigious SIGKDD doctoral dissertation award. SIGKDD is the flagship venue for data mining. Alex’s dissertation, titled ‘User Behavior Modeling with Large-Scale Graph Analysis’ focused on anomaly detection, by modeling normal and abnormal users, as well as on the design of scalable algorithms for large graphs. Vagelis’ dissertation, titled ‘Mining Large Multi-aspect Data: Algorithms and Applications‘ bridged signal- and tensor-analysis, with data mining at scale, and illustrated the power of the resulting methods in several, real-world applications (brain-scans, social networks, subject-verb-object collections of facts, and more). The winners and runner-ups will be officially announced and recognized at KDD 2017 in Halifax, and they are invited to present their work at a special DDA session on Tuesday, August 15, 4-6pm.